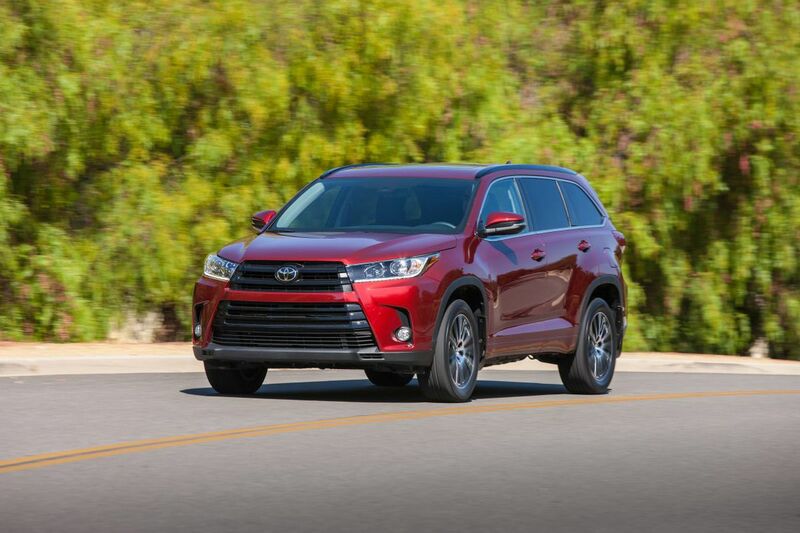 The 2018 Toyota Highlander continues its long run in the United States and is surprisingly about the same size as the Atlas. 2018 Volkswagen Atlas V-6 SEL Premium with 4Motion vs. 2018 Toyota Highlander Hybrid V-6 AWD: Battle of the midsize three-row SUVs. Price: $50,275 for the Atlas as tested (starts at $30,750), vs. $37,479 for the Highlander (starts at $31,030). Catching up: Last week we climbed around inside the midsize SUVs. Today, we take them out for a spin. Up to speed: The Volkswagen Atlas had a 3.6-liter V-6 that produced 276 horsepower. I found the vehicle to be a bit of a dog getting itself moving, a surprising thing. Sport mode helped quite a bit in this endeavor, but still, it felt underpowered. The Highlander Hybrid has a 306-horsepower engine and motor powertrain that keeps the vehicle motivated. It actually seemed peppier than the Atlas, although with some drawbacks. Somewhere in the hybrid system, the Highlander produced a feeling of unsteadiness, as if the power shifted from side to side under hard acceleration. Both vehicles were all-wheel drive. The 2018 Volkswagen Atlas is the company’s first attempt at full-size, three-row SUV. It’s not a design triumph. On the road: While each driver's seat felt like coming home again — both very true to their respective makes — the handling in both was unexpected. The Highlander was no sports car, but it handled winding roads with some grace. At first it felt tippy and I watched everything — phone, backpack, other assorted objects — slide from side to side when I turned. I think maybe I was taking the turns a bit hard, and after we got accustomed to each other, the SUV seemed to be an agreeable sort. Unusual, because Toyotas tend to be the floppiest large vehicles around. The Atlas, however, felt big and bulky from the start, and that never changed. The ride was exceptionally smooth over bumps, but while piloting the Atlas, I felt as if I were condemned to hold the sky up. Shifty: The Atlas came with an 8-speed automatic mated to Volkswagen's joystick, where Sport and Drive are toggled by pulling the shift lever, while full shift capability resides along one side. The Highlander looks as if it's shiftable, but it's simply a gear limiter for deciding, say, you want to keep the vehicle in fourth on a long hill. Beyond that, both transmissions functioned without drawing much attention to themselves, always a good thing. Play some tunes: I can hear! I can hear! That's what I almost shouted in the Highlander. After whining about the Toyota (and Lexus) stereo systems for years, I found the Highlander's bare-bones stereo to be the first Toyota unit with adequate sound. It wasn't the best, but a B+/A- is a pretty good grade for a Toyota. I could finally find some midtones and not suffer whiny treble in my ears and thumping bass pounding my chest. Toyota is fairly stingy with amenities, though — something I expect from Sturgis Kid 1.0's Scion iM, not from a $37,000 Highlander. This model came without navigation or Sirius, both reasons I might pass it up all together (although it certainly has room to option up before the price catches the Atlas). The Atlas had Fender-upgraded stereo, so it was at least an A-. Navigation, Sirius, and CarPlay all came without any added cost. Night shift: The interior lights in the Atlas were of the upper-class sort we've become accustomed to, but they're not well directed. Turning front lights on at all while driving interferes with the road, while using the back doesn't cast enough light where needed. The headlights were also a little on the dim side. The Highlander offered a much better nighttime experience. Fuel economy: Here, of course, the Highlander has the unfair advantage of a hybrid powertrain. It averaged 25 mpg during a lot of highway use. The Atlas resets its trip information after every shutdown, but I noticed about 19 to 20 in a mix of highway and suburban driving, and some stop-and-go city rides. Where they're built: The Atlas hails from Chattanooga, Tenn., while the Highlander is built in Princeton, Ind. How they're built: The Highlander has garnered 5/5 in Consumer Reports reliability surveys since 2014. The Atlas, a brand-new model, gets a predicted reliability of 2/5. That's probably not a bad assumption, considering Volkswagen's track record. In the end: The Toyota Highlander probably would have had me sold on reliability alone. It also turned out to be a nice-handling vehicle that isn't too shabby even down at the low end of the price range, especially for a hybrid with 20 percent better fuel economy. The Atlas does have 15 percent more interior space, which is great when you need it, but I was surprised at the lack of a roomy passenger compartment here.